Chairman of the board of directors, Create Now! 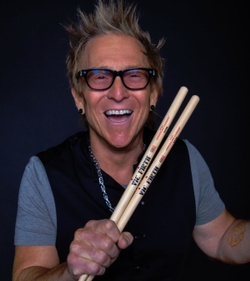 Mark Schulman has enjoyed an unprecedented career over the last 28+ years as a first call drummer for world-class rock and pop artists. He has been voted ‘Top 3 Pop-Rock Drummers’ in the 2014 Modern Drummer Reader’s Poll. Having finished his third record breaking world tour with P!NK (featured in the DVD, ‘The Truth About Love Tour’ as well as DVDs from her ‘I’m Not Dead’ and ‘Funhouse’ tours) Mark joined Cher for her ‘Dressed To Kill’ World Tour 2014. Mark’s resume reads like a “Who’s Who” of international Rock n’ Roll royalty including acts such as Billy Idol, Foreigner, Sheryl Crow, Stevie Nicks, Beyonce’ and so many other world-class artists. He has drummed with Velvet Revolver at Ozzfest and for crowds of 200,000 at the Glastonbury Festival with Simple Minds. Mark has appeared on nearly every American and European variety show on television including The Grammys, The Late Show, The Tonight Show, Conan O’Brian, Jon Stewart, American Idol, Paul O’ Grady, X-Factor and Wetten Das. Music is not Mark’s only driving force; he was the chairman of the board of directors of Create Now! a non-profit organization founded in 1996, to help change troubled children’s lives through creative arts mentoring. A cancer survivor, Mark has also motivated children and teens through his work doing seminars with the Ronald McDonald House and benefits for the Teenage Cancer Trust in the UK. Schulman is a classically trained cellist and as a teen, played with the Los Angeles Junior Philharmonic. He played cello on the 2009/2010 P!NK tour! He is also a music producer, trained audio engineer and studio co-owner of West Triad Recording Studio in Venice, California. As an active educator, Mark taught at the Los Angeles Music Academy and as one of the world’s most sought after drum clinicians, hosting clinics in countries around the world. Mark produced his first DVD in his studio entitled, ‘A Day in the Recording Studio; A Do-It-Yourself Guide to Recording Great Drum Tracks for Drummers and All Musicians’ distributed by Hudson Music. The Mark Schulman Signature Snare Drum is the best selling signature product in the history of Gretsch. Mark’s presentation is like a rock show disguised as a keynote with live drumming, interactive performances, compelling and emotional stories from his experiences playing. He incorporates multimedia and drum performance/entertainment to describe, explain, enhance and captivate the audience. He also includes interactive activities that focus on kinetic processes that get attendees in touch with their own rhythms and strengthen emotional connections with their colleagues and families. For availability and speaker fees, please contact Mark Schulman’s speaking agent at Chartwell here, or call +1 972 385 1021 for U.S. inquiries or +44 207 293 0864 for international inquiries.